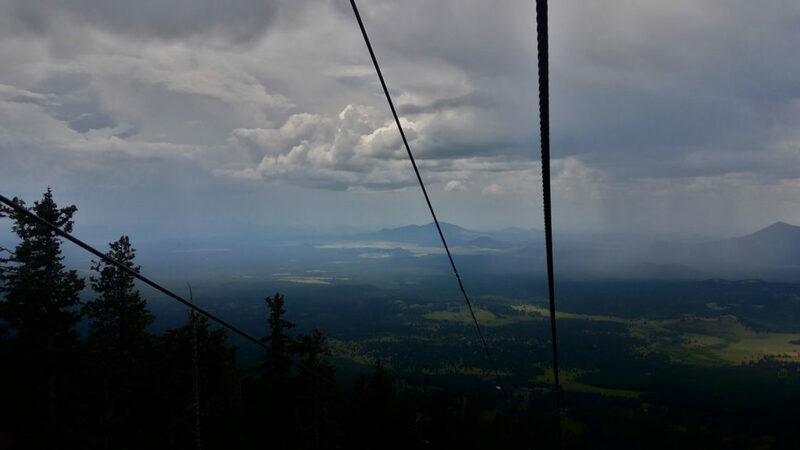 An electrifying day on the Snowbowl ski lift in Flagstaff, Arizona during a lightning storm. It started out as a beautiful sunny day. We came prepared for a nice ride up a mountain and expected to take a few photos at the top and then come back down. Today was not what we expected and because we are alive, I can say it was an even better day with all the excitement. My over prepared packing came in handy. 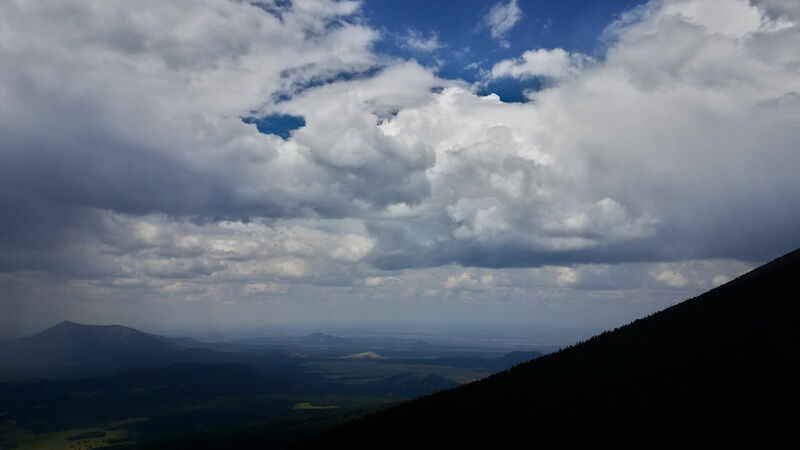 There had been raining off and on in Flagstaff the day before. So, I had packed ponchos in our day backpack. We had 2L of water. There were a few snack bags of mixed nuts, fish crackers, and granola bars. The ride up the mountain was to be a nice leisurely 30 min ride. 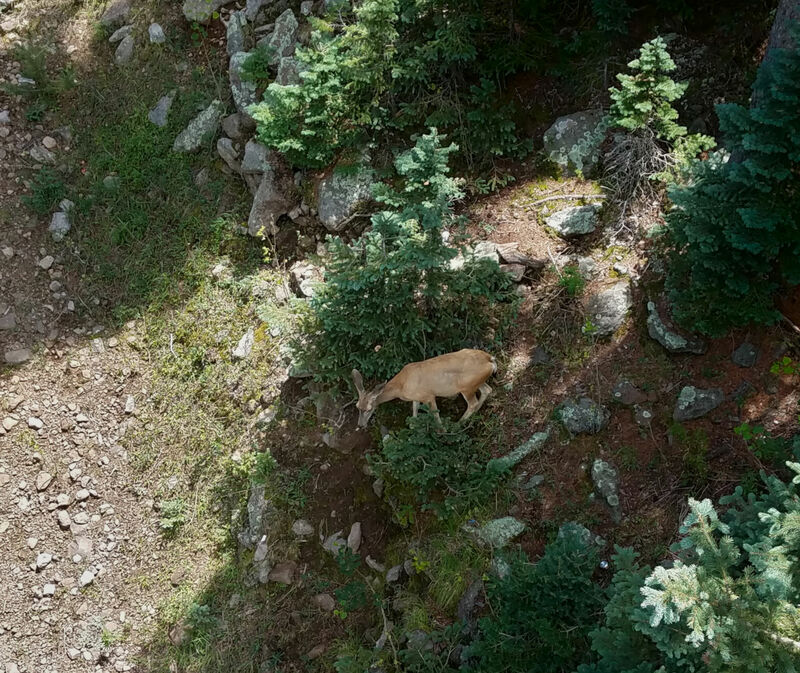 Hunter and I sat hand in hand viewing the wooded scenery on the mountain slopes. Hunter spotted a deer as we rode over a clearing. It was hot and sunny. We had put on floppy hats and sunscreen to protect ourselves from a sunburn. After about 15 mins, the wind picked up and it started to get cooler. On the opposite side of us were the ski lift chairs with people coming down. We started to notice the people coming down the mountain putting ponchos on their children. Then we observed that we were starting to get cloud cover. Next, the temperature dropped so quickly that I put on a coat that I had wrapped around my waist. By now, the people that were coming down were also putting their ponchos on. Finally, Hunter turned around to see what was behind us. There was a lot of dark clouds and then we saw lightning and heard the thunder. Suddenly the ski chair lift picked up speed. As we neared the top of the mountain rain had started to fall and we put on our ponchos. Once we reached the top the chair operator gave us instructions to quickly get out of the chair and run to the safety shack. The safety shack is the building where the safety ski patrol are staffed during the winter months. We ran to the safety shack and found 17 people and 3 staff crowded in a 10 ft x 16 ft room. The main staff lady quickly had people move over on a bench so that we could sit down. The chair operator came in and let us all know that they can not operate the chairlift during a storm and we could be in this room for 5 min or 5 hours, as long as the storm lasts. The staff lady in charge then took inventory and said they had limited water and a few snacks for everyone. I was grateful at that point that we had our own water and food. The staff lady reassured us that the building was grounded and had a lightning rod on top. She said the day before lightning did strike the building and if it did again today, just the hair on our body would stand up. “Everyone would be okay”, she said. During all of this, there were 2 people standing outside and on a side porch of the safety shack. The staff lady tried to get them to come inside but the one male was very angry and was yelling at her that he was going to stay outside and no one would tell him what to do. After about 30 min, the chairlift operator received word that they could send people back down 3 at a time because there was a break in the storm. They quickly moved 3 people out of the shack at a time. Since there were sending 3 people at a time, a nice lady was put with Hunter and me on our ride back down. The ride down was about 10 mins. We reached the base of the ski lift and we went into the ski lodge. We choose to have lunch there and relax. The ski lift remained closed while we were there. I would defiantly go on the ski lift again. 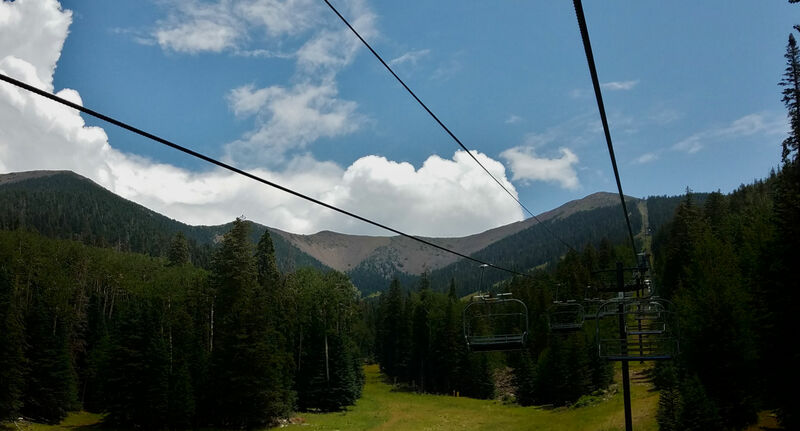 Have you ever been on a ski lift for skiing or for a ride? 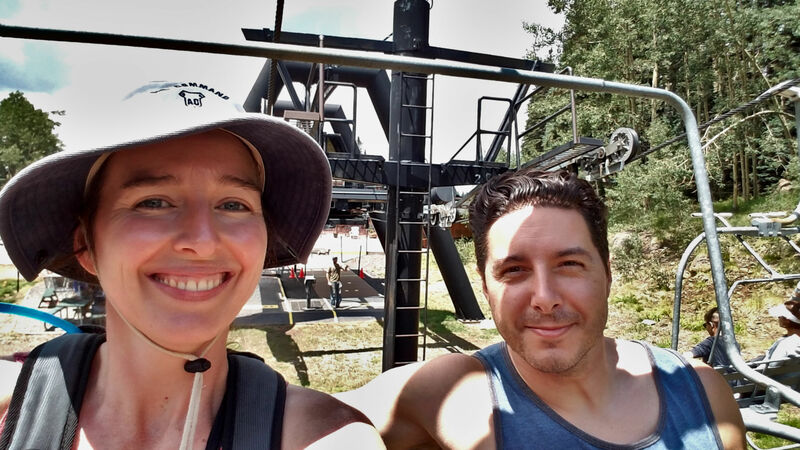 My family has skied at Snowbowl many times and the kids and I just went to Snowbowl yesterday for the summer ride. I’m happy to report that, while there was a little rain, there was no rain and we had a safe and fun visit! It is a great place. We can’t wait to go back. I am glad you had no rain and a safe and fun visit. Nope…Nope! Not doing lightning! That is so scary. I do love the rain! I bet that part of ur adventure was gorgeous!! Thx for sharing! Yes, the rain part was gorgeous. That was a lift to remember! Love that you were much like a boyscout & well prepared. Love ski lifts. Have only used them in Colorado while skiing growing up. Deffinetly want to do this one in Flag. Thanks for sharing! You two are the best! 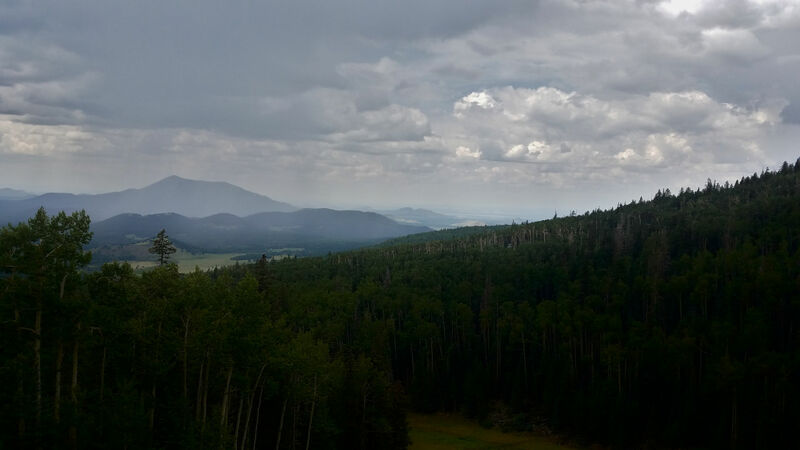 We will have to check out the one you suggested in CO.
What an adventure! Glad everyone made it down safely. Crazy. Good thing that you were off the lift, that would’ve been really scary to see the lightning while you were stuck on the lift. Great story though and happy you can tell it. Scary! Glad they have safety precautions in place, and glad you guys made it back down safely. What a scary experience, but glad you were safe and they had a procedure in place. Sounds like a fun, but scary adventure! So scary and exciting at the same time! Sounds like the employees were trained well. Thank goodness! Yes, I was glad they were calm. Crazy! I bet you won’t forget that any time soon! I’m glad everyone was alright. I haven’t been on a ski lift in years and years! What scary cool adventure! What a crazy story! And what an amazing jerk who yelled at the very person who was trying to keep him safe.